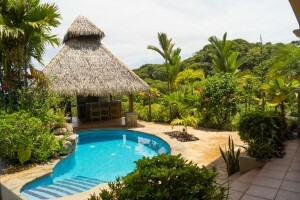 Boasting stunning ocean views from all levels, this fully furnished modern home is well-adapted to the tropical climate of the Southern Pacific Region. Named “Summer Twilight” it turns into a magical locale once the sun begins to set on the ocean. Located in the village of Ojochal, the home features an open concept design downstairs that flows out to a covered patio, pool and rancho, perfectly designed for entertaining. With one bedroom and bath downstairs, the second floor has two more bedrooms and a bath, plus another living area and covered deck. The kitchen is fully equipped and features granite counters, stainless steel appliances, and a bar that seats six. There is also a garage and secure owner’s storage, along with beautifully landscaped grounds and large parking area. Built of solid concrete, it is an attractive acquisition for the discerning buyer seeking both quality and durability. Security is no issue here, as the fenced home has an electrically controlled entrance with intercom and paved driveway, and is part of a two-property enclave, each separately titled. The two properties are separated by a landscaped 40-foot garden that attracts local fauna and ensures privacy for each residence.